Tori Huster was the Washington Spirit’s second pick in the 2013 NWSL Supplemental Draft. 2018: Appeared in 17 regular season games, including 15 starts. She totaled 1,283 minutes of playing time in the midfield and on the backline. She made her historic 100th appearance for the Spirit in the season opener against Seattle Reign FC. 2017: Played in 20 regular season games, extending her Spirit record of games played with the team to 103. 2016: Played and started 19 regular season matches plus all 120+ minutes of both postseason matches…scored one goal and had one assist…played the most minutes of any Spirit player in 2016. 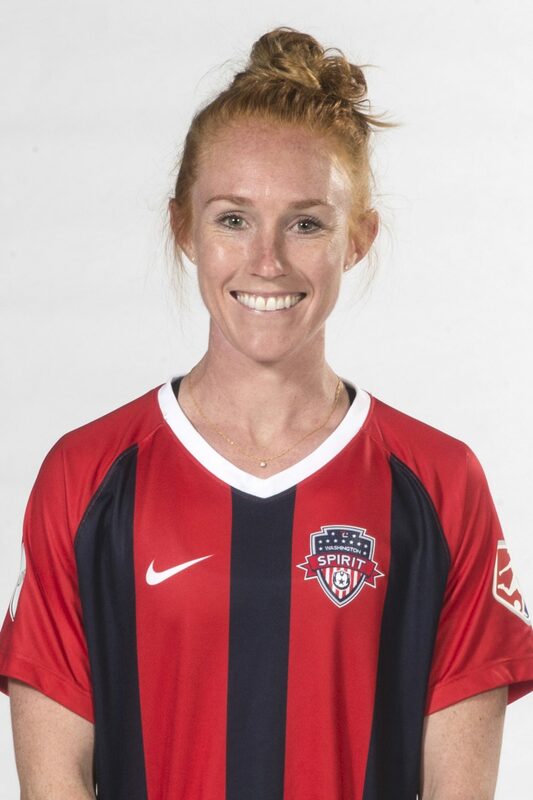 2015: Played in 17 of the Spirit’s 20 matches, totaling 1177 minutes…2014: Started all 22 games in which she played… Scored one goal and tallied one assist in 1980 minutes played. 2013: Was the Spirit’s second pick in the 2013 NWSL Supplemental Draft…Started all 21 games she played in…Scored one goal in her 1880 minutes played 2012: Selected 8th overall by the Western New York Flash in the 2012 WPS Draft…Played with the Flash in the WPSL-Elite league. During the 2013/14 offseason, Tori played for the Western Sydney Wanderers in the Westfield W-League in Australia. She returned to Australia and her first W-League team the Newcastle Jets for the 2014/15 offseason. In the 2017/18 offseason, she made 12 appearances on loan with the Newcastle Jets, scoring three goals including a highlight reel goal on December 29. United States National Team: Called up to the senior U.S. Women’s National Team for matches in France and England in February 2015…Participated in numerous U-23 camps…Invited to U.S. U-23 National Team camp April 18-25, 2010…played in a pair of friendly matches including starting and playing all 90 minutes against the University of Portland… Member of the U-23 squad that participated in the Four Nations Tournament in Leicester, England, July 7-12, 2010…helped the U.S. to tournament victory posting a 2-1-0 record…saw playing time against England and Norway… Invited to U-23 camp in December of 2010 at the Home Depot Center and then again on April 24-May 1, 2011 and May 15-21, 2011… Participated with the U-23’s at the Three Nations Tournament in Falun, Sweden, June 12-22, 2011. Prior to that, the midfield stalwart was a four-year starter in college at Florida State, an integral part of the 2011 squad that made the College Cup that season. She made 92 appearances during her career for the Seminoles, scoring 20 goals and adding 19 assists. Huster was named a first-team Scholar All American by the National Soccer Coaches Association of America in 2011, a third team All American, as well as first team All-ACC in her final season at FSU. NSCAA All-American Third Team (2011)…NCAA College Cup All-Tournament Team (2011)… All-ACC First Team (2011), Second Team (2010)… ACC Scholar-Athlete of the Year (2011)… NSCAA Southeast All-Region First Team (2011), Third Team (2010)… NSCAA Scholar All-American First Team (2011)… WSU Invitational All-Tournament Team (2010)… Finished 2010 season as the as 88th ranked player on the Top Drawer Soccer’s National Top 100 Women… All-ACC Freshman Team (2008)… Soccer Buzz Freshman All-American (2008 – Third Team)… Soccer Buzz Southeast Region All-Freshman Team (2008)… Capital One/CoSIDA Academic All-District IV First Team (2011)… Two-time CoSIDA Academic District III Second Team honoree (2009, 2010)… NSCAA South Scholar All-Region First Team (2011)… NSCAA Southeast Scholar All-Region Second Team (2010)… ACC All-Academic Team (2009, 2010, 2011)… Three-time ACC Academic Honor Roll honoree (2008-09, 2009-10, 2010-11)… Recipient of the Golden Torch Award at Florida State for achieving the highest GPA among soccer student-athletes during 2009-10 semester… Four-time FSU Dean’s List honoree (Fall 2008, Fall 2009, Spring 2010, Spring 2011)… FSU President’s List – 4.0 GPA (Spring 2009)… Finished with 91 career starts – ranked fifth all-time at Florida State…19 career assists – tied for the eighth most in school history.